Wake up!! It’s your first day as vice president of the world! You need to get out on the streets into the public and do your job. Talk to your citizens and make them join your side. Get on a huge adventure and send your members into battles. Use their individual abilities for advantages, and either a variety of surprising side effects or to make progress as a dark threat is trying to bring chaos upon your empire. Eden Industries first Wii U game Citizens of Earth is finally available, a modern RPG inspired by cult-classic EarthBound, with a focus on its 40 different characters, a huge colorful world brimming with side-quests and secrets, and a light-hearted story full with witty dialog. This is essentially a roundbased RPG without invisible random encounters. You can see all enemies as you walk around and get into battle if you touch them. It never feels like too much of a grind. Travel through classic areas like towns, forests, swamps, the desert, a factory, and not so typical environments like the internet, a dream world, a hippie trailer park, the bottom of the sea, and much more! It’s difficult to talk about the good things without taking too much away because the best parts are actually the little surprises that the citizens can bring to your party. Just take the car salesman: His “attacks” are more of the verbal kind that can confuse enemies and drain their energy with sales contracts. Outside of battles he can summon a car that you can drive around. You can even run over enemies with it. I didn’t see that come. Others like the conspiracy guy can keep track of all enemy encounters and their attacks and stats and add them to a practical list. The bodybuilder can pick up heavy boulders to open up locked paths and the handyman can repair doors. Some citizens are selling stuff, while others provide new sidequests or make travelling easier. Honestly, these are just the normal ones. There are citizens that can change the weather, the music, the game speed, the stats, and even the difficulty! 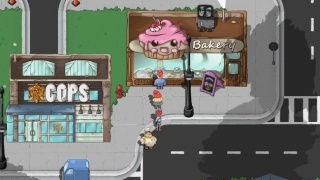 Citizens of Earth is an open world game where you can do things in your own order, breaking away from the main objective and getting into high level territory early on. There are lots of different environments, presenting variety with new challenges, fun sidequests, crazy enemies, great music, and more to keep you going. The environments are quite large, so it comes in handy that almost every area has a handy map with icons that show your objectives but also treasures and NPC’s to talk to. The graphics could use more detail, especially indoors, but the citizens and their funny animations and the amount of different outdoor areas make up for it. All in all it looks and sounds very charming and inviting. There is one major issue though that heavily detracts from the brilliant experience. And it’s not the loading times - this game is huge after all and loading only occurs when entering a house or a new area. No, the major issue is that it seems to be an unpolished and untested version: You’ll encounter a huge swarm of bugs, frequent soft crashes and random hard freezes, and more than just a few graphical glitches. There’s the possibility of getting stuck inside objects as the framerate skips, and also just by walking into certain spots that will trap you. I found item boxes that were opened and empty already, unintentional shortcuts, and whole areas of enemies you couldn’t fight until saving and reloading. 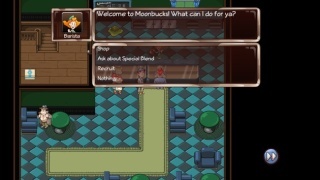 Many citizens also have glitchy skills: The firefighter’s rescue tech seems to drop you into random spots sometimes, the beekeeper’s zoom out function will make some cutscenes look glitched, and the yoga trainer can make your characters go beyond level 100 and her HELP-button instantly crashes the game. Time-based skills like the teacher’s class and the brother’s order service can just mess up everything, and the salesman’s car gets stuck in enemies all the time. The pilot seems to be quite practical at first but most of the landing zones are dead ends with just a few collectibles you couldn’t get otherwise. Also the map shows a landing zone in the school’s backyard but you can’t fly there and when you walk there by foot you just see a blank placeholder instead of the landing pad and need to resort to a different and much more impractical landing zone. Other bugs I encountered were the touchscreen that is developing its own life sometimes, some areas that totally glitch out by random, locking up the console when you want to quit and go back to the Wii U menu, and even a sidequest that crashed until I changed the language settings in my Wii U to English. Fortunately, and to keep frustration to a minimum, the autosave feature (everytime an area is loaded) will make sure you never have to replay much, so there’s at least a light at the end of the tunnel. Also, you can save manually whenever you want (outside of battles) to reduce the frustration of replaying larger sections even more. Despite all these bugs I was able to complete the game with all 40 characters, all quests, and all achievements in 40+ hours. The amount of content you get for the price is outstanding and one or two generations ago this could have easily passed as a full price retail game (without the bugs of course). You get more fun playtime out of it than most of the other Wii U eShop games (that are often a tad more expensive). 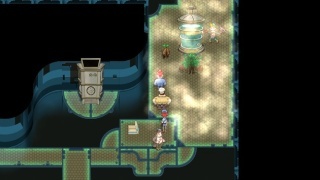 And even with all the glitches and crashes it manages to be more addicting than most other bug-free RPGs. It’s hard to rate the game in its current state. If it was polished this would be an instant classic! On one hand it’s a 10/10 gem and certainly one of the best indie RPGs ever made. On the other hand I really don’t want to support highly unpolished, frequently crashing games where you need to stand up regularly to hold the power button on the Wii U console for 5 seconds just to get back into the game. Citizens of Earth is brilliant, but plagued by major technical issues. We hope Eden Industries is going to update it soon! Leaving the game in this state would be an insult to both the developers for all the work they’ve done so far, and to the players who bought the game expecting it to be quality tested and running at least normally. Until then we’ll have to compromise with a lower rating. That's the score I would give it, overlooking the problem lies a really nice game. Nice review! Thanks for writing up another awesome review @SKTTR! Citizen of Earth have too much issue I would give 6/10. I'll wait till a patch is released. This is a wonderful game! I agree with the score too. Good review. Is a patch currently being worked on for the Wii U port? I finally beat this game and I have to admit that even though it has a ton of bugs it's still a very solid game. @SKTTR It would be awesome if you reviewed OlliOlli for the 3DS! Thank you. What score would you give it? @ToughGamer wrote: Good review. Is a patch currently being worked on for the Wii U port? Yes, a patch is in the works. They sent it off already. Should be out soon. Hopefully it will sort out all the major glitches. It would be amazing if they get it all sorted out in their first patch but I think it will need another update after that for all the minor bugs. Rukiafan wrote: I finally beat this game and I have to admit that even though it has a ton of bugs it's still a very solid game. Yeah, I don't know what else to say. It is extremely fun, and so different from other games, and it's huge! The amount of content for the price is simply outstanding. That's what kept it from getting a lower score. The amount of bugs however kept it from getting a higher score. Thank you. I might do a series of mini reviews. OlliOlli on the 3DS is pretty good. Has this even release in Germany? @Nell TU wrote: Has this even release in Germany? Here's a list of European eShop games that are not available in the German eShop. 8. Tested with robots ! *Very unfortunate as these are great games! I really need Gravity Badgers since it's made by the same people who made Master Reboot.